Use Love Thoughts as a lovely table decoration to dress up any event. 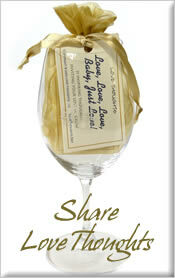 Love Thoughts are a perfect dinner party gift because they make a great take-home present for your guests. Read and listen to our inspiring Love Thoughts, and see the Biblical Scripture references for each one. Read inspiring Love Thought stories and ideas and share your reflections of love. 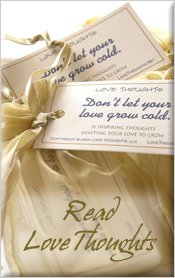 Purchase Love Thoughts for your special occasion or simply to present someone with love and encouragement. Welcome to our labor of love! We seek to find love where it exists and to invite it to be where it has yet to exist. Love Thoughts are 31 inspiring thoughts printed on quality paper and packaged in a golden pouch. Love Thoughts come in two versions, with or without Scriptural references. Love Thoughts make elegant and inspiring wedding and anniversary favors. They are the perfect complement for any occasion. Love Thoughts offer a uniquely thoughtful way to share your love. Each Love Thought can be traced to its Scriptural root, and with each Love Thought we have included a link to that root. Please share Love Thoughts and let us know what happens. Thank you for your interest!